Internet business or network marketing is the way to go – it’s the way of the future. It is so much easier to make use of the internet to build an internet marketing home based business. I am excited and amazed at the ease with which I am doing business on the internet and creating a website! These are the figures for mid 2015 and the anticipation is that it will continue to grow especially as more people become unemployed. I am involved in network marketing and I love it! I have met so many people, who over the years have become very good friends. People I would never have met had I not been involved in an internet business combining network marketing, affiliate marketing and the ability to work from home! Read how Big Al Schreiter defines network marketing and you will understand that you do unknowingly do this whilst holding a conversation. Why wouldn’t you want to get paid to do this and take the opportunity to work from home? This is a form of distribution of products, ideas etc. It can also be called Direct Sales or Multi Level Marketing. What I do is not pyramid selling! The internet business that you choose to be involved in will define the distribution of your commodity and the compensation that you may earn. 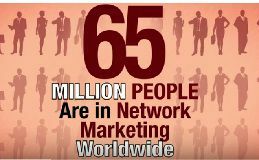 By speaking with people and introducing them to your home based business that enables you to work from home, and engaging their interest, helps to spread the word and thus the term network marketing comes into being. Sometimes when speaking with people who may not be interested it can be prudent to ask them if they know of anyone who may be interested. This is called referral marketing and can be quite successful. Has someone ever thought about you and offered you the opportunity to join with them in an internet business or network marketing opportunity? If you have then I would be very happy about this as the opportunity could change your life albeit in health or wealth. Click this link to read about home based business opportunities that are open to you. If you decide to take up the this business opportunity, then please ensure that you do integrity network marketing. This is important. Always tell the truth when you are asked questions. If you are honest and upfront with people then they will learn to trust you and your integrity and you may find lifelong friendships forming from these partnerships. NaturalNews on 14 October 2015 issues warnings about how the Google Search Engine is becoming the “Ministry of Truth”. In other words when you use the Google Search Engine to find information on a topic that interests you – Google is planning to tailor your search engine results. This is not what the average person believes that Google is about or even that it might be doing this to the information they find. Click this link to learn more. Before I continue with this page I would like to provide a warning to children. The following document was sent through to me by a friend. I believe that this is an extremely important document for parents, grandparents and children to read. It shows how a young girl who thought she was doing the right thing by not revealing too much information about herself to protect herself from unethical people in fact was doing just the opposite. This young girl was very lucky and her lesson should serve as a warning to everyone using their computers to do internet business to be aware of personal information that they may be giving about themselves. Please take the time to read this. In today’s climate it is very easy to become negative. Negativity impacts on our lives in many ways. Read 11 of the benefits of being positive. "Thanks to eBay I quit my corporate job and now work a lot less and earn A LOT more money..."
This link will take you to more information on The Silent Selling Machine on E Bay, an internet business where you don't need a website! Start Your Own Home-Based Affiliate Marketing Business With Super Affiliate Rosalind Gardners Expert Guidance! Topics Include Blogging, Market Research, Affiliate Programs, Web Design, Problem Avoidance And So Much More! Updated Completely For 2007.